Long trek through the rice and corn fields, visited and homestay at the Flower Mong and Phu La village. Pick up at your hotel in Hanoi city central then transfer to station for a night train to Lao Cai. The train arrives in Lao Cai at 05.30' am. You'll have breakfast in the restaurant, and then the bus ride up hill to Bac Ha takes about 2 hours, giving you a glimpse of the stunning vistas and impressive rice terraces. 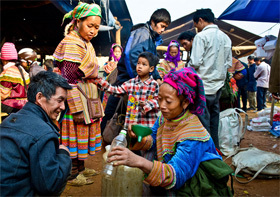 Start at 9.00am from Bac Ha trekking uphill along local trails and across rice paddies to visit Flower HMong ethnic minority communities. It is a great view, wandering through vegetable gardens and rice terraces. Have a picnic lunch along the way. 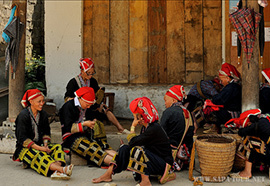 Overnight at the H’Mong hill tribe family where you can participate in the traditional fiber processing including: Peeling off the barks from the dried hemp stalks, Tie the stripped bark ribbons to form bundle, weaving... homestay in the village. Get up in the early morning and enjoy the fresh air of this country side, having breakfast. Starting the tour at 9.30 am. On the way, you can see many hills which is used for planting corn or rice. In addition, there're green fields and the forest which combined to make a place of natural beauty. 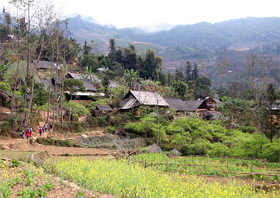 Staying at Phu La village for a night, you can discover their living in this highland. Meals: (B; L; D); Trekking distance: 15 km. Meals: (B;L;D); Trekking distance: 12km. Arrive Hanoi in the early morning, back to your hotel by yourself. End of all services here.